Colin Kaepernick: once a starting National Football League (NFL) quarterback, now controversial political activist. On Monday, Nike, one of the largest and most popular athletic apparel brands, released an ad featuring the controversial ex-quarterback and sparked a national debate. 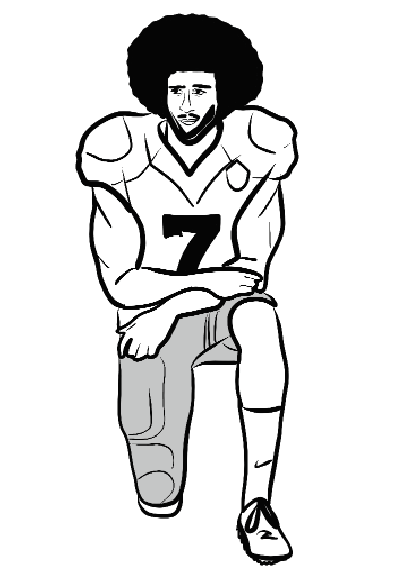 As a player, Kaepernick used the NFL as a public platform to protest what he considered police brutality and what he perceived as America’s ongoing oppression of minorities in the country. After famously kneeling for the national anthem during games, which prompted others to follow suit, Kaepernick sported socks with pictures of police depicted as pigs and even donned a shirt featuring Cuban dictator Fidel Castro and civil rights activist Malcolm X during a press conference. This Kaepernick is now the face of Nike’s new ad campaign. Though I stand with Nike, I stand with them more on a business front. The slogan “Believe in something even if it means sacrificing everything” and it being attached to Kaepernick is flawed. The true men and women who make sacrifices can be found on the battlegrounds of Afghanistan where United States soldiers fight and die to give Kaepernick the right to speak freely, all while he sacrifices his NFL career yet still makes millions of dollars. I do not support Kaepernick and his protests. I believe in what he is fighting for, but I do not believe in how he is going about his protest. Black Lives Matter is an incredible movement that needs to stand strong. This country is not free of racism and oppression; protests need to be had and steps need to be made. However, Kaepernick conducted his in an erring way. Kaepernick and those who followed in his footsteps have made their point, yes, but instead of America focusing solely on the goal of their protests, people see it as disrespecting the flag and the people who fight every day to protect us. This ultimately taints and overshadows the Black Lives Matter campaign. Kaepernick should have gone about his protest in an entirely different fashion. The entire discussion around Kaepernick would be entirely different if he had only made comments in press conferences, worn message-adorned apparel like LeBron, or gone outside of the game to make things happen, like we see with LeBron opening a school for impoverished kids. Sports should be used as a platform, but protests should not be brought into the events themselves, especially not the national anthem. It should be noted that highly notable athletes such as Serena Williams, Odell Beckham, and LeBron James are also featured in the ad and are overshadowed by Kaepernick’s controversy. The fact that sports giants like LeBron and Odell are being overshadowed speaks volumes to how disputed the ad is in the eyes of the nation. People are beyond angry— burning their apparel, with a preacher in Mobile, Ala. even cut ting up his Nike items in church. A private Christian college, College of the Ozarks, is also severing ties with the brand over the ad. Just a few days after the ad was released, it generated buzz in the media worth $43 million. While Nike’s stock dropped slightly on the ad’s release date, the mega-company has already recovered. In fact, its stock value as of Sept. 11 had surpassed the value it was before the ad. Eric Smallwood, president of Apex Marketing Group, measured the branding exposure for Nike’s new campaign and told CNBC, “Right now what this means is they are winning the battle from the public relations side.” This is good news for the company after the risky decision to attach Kaepernick’s controversial face to their ad. With Kaepernick bringing in an overwhelming amount of political debate, the potential for increased brand exposure appears to outweigh the short-term backlash. Nike’s target audience is not found strictly within the United States, but reaches far beyond the country, encompassing a large international audience. With this political debate generally restricted to the domestic arena, it is reasonable to believe that this particular ad would not make a difference to members of an international audience, as they do not have to worry about Kaepernick kneeling during their country’s national anthem. In addition, consumers like sneakers, apparel, and equipment and may not consciously make political decisions when purchasing these products. Maybe some people now will, but the overwhelming majority likely will not. The bottom line, then, is that Nike consciously knew what they were doing and whose face they were attaching to their ad. In picking Kaepernick, they successfully generated an incredible amount of publicity, which will turn into positive outcomes. Kaepernick is a man of intrigue, now known across the nation for his protests and not his athleticism. Seems as though he is alright with that, as his pockets fill with green from sponsorships. He and his Nike ad will continue to be highly debated and picked apart. Though he mishandled his method of protesting, Kaepernick will go down in history as a man who believed in something, even though he sacrificed everything.